Cheese Industry I Rheolution - Rheolution Inc.
Optimize your coagulation process using CoaguSensTM ! Regardless of producer size and type of cheese, the milk gel-cutting step is probably the least controlled step in the cheese making process and a large part of the overall cheese yield depends on this critical step. Many cheese manufacturers resort to finger palpation, a technique with known disadvantages such as the inability to perform the test in real time and scarcity of experienced cheesemakers. A method that is also subjective and not quantitative. CoaguSensTM tells you the exact firmness value you cut the curd at. Testing cuts at lower and higher firmness values and checking the resulting yield allows cheesemakers to target the right cutting firmness and to reach the highest yield, step by step. 1) Deliver consistent quality products to your customers. 2) Use a modern and efficient tool to make production process even more efficient. 3) Be in full control of milk coagulation and the critical cutting step. 4) Anticipate and fix coagulation issues. 5) Eliminate surprises and stress from you day-to-day production operations. CoaguSensTM is the first process instrument located near (but outside) the vats that delivers accurate and real time measurements of milk coagulum firmness. CoaguSensTM was designed WITH cheesemakers FOR cheesemakers. CoaguSensTM is NOT a hotwire or light scattering based technology that both deliver a prediction of cutting time without measuring actual firmness. With CoaguSensTM, perform your gel cutting exactly at the right firmness and you’ll get the highest retention of milk solids and the highest yield. In the first phase of the deployment, cheesemakers run their usual manual palpation technique to decide when to cut and curd firmness is measured with CoaguSensTM in parallel (+/- 40 vats). This tells the cheesemaker what average cutting firmness is for each recipe. In the second deployment phase, the 40 vats current average cutting firmness is calculated and used as the target cutting firmness for the 40 following batches. This will dramatically stabilize the coagulum-cutting step and thus the milk solids retention rate (vat yield). Variability of firmness at cut is significantly reduced. Now that a higher coagulation control has been achieved, it can be optimized! In this phase, the cheesemaker moves the cutting firmness up or downwards as compared to the average firmness obtained in phase 1. Doing so the cheesemaker will determine the suitable cutting firmness for a given cheese formulation. With time and experience, CoaguSensTM becomes the ultimate cheesemaker tool to control firmness at cut and to increase the performance of the coagulation step. In that North-American cheese plant, CoaguSensTM was used in phase 1 to monitor the coagulation of 37 cheddar batches. Located near coagulation vats, CoaguSensTM measured curd firmness in real-time and recorded firmness at cut for every monitored batches. Firmness is measured in pascal units (Pa): the more pascals, the firmer the curd. The solids retention rate was calculated from tank milk solids and whey solids, both measured with a Near Infra-Red (NIR) milk analyzer. Data shows that solids Retention Rate is a much better coagulation performance indicator than yield that is influenced by cheese moisture and all the process steps following coagulation. Cheesemakers used CoaguSensTM to assist their decision on when to cut. They initially targeted 235 Pa for which solids retention rate averaged 60%. When they targeted 170 Pa, the solids retention rate increased to 63.3% resulting in a yield improving from 14.6% to 15.4%. Every 35,000 Lbs milk vat delivered 5,124 Lbs cheese at 60% Solids Retention Rate and 5,407 Lbs at 63.3% Solids Retention Rate, so 282 Lbs more cheese per vat. At this particular cheese manufacturer, rather than relying on processes to recover lower value reprocessed whey ingredients, profitability was increased by using CoaguSensTM to help with conversion of milk solids directly into cheese. * This calculator is provided as a simulation tool. Rheolution Inc. does not guarantee the full achievement of the results of this simulation. How many vats can one CoaguSensTM handle? 2 to 3, depending on vat overlap and coagulation duration. What is the basis for the ROI calculation? Optimizing cutting firmness increases the solids retention rate (% of solids that go from milk to cheese) in curds and consequently the overall cheese yield. Payback for extra cheese produced is 6 to 8 months. What is the usual time between CoaguSensTM installation and the beginning of cost savings? This time depends on the number of vats produced per day. Usually 40 vats are used for the learning phase and 40 more vats to stabilize process at a fixed cutting firmness. At this point, optimization and ROI begin. Are the sample container consumables expensive? Sample container cost is paid back through the improvement of milk solids retention rate (vat yield) and represents a fraction (typically 1 to 5%) of the savings generated for each vat. What support does Rheolution offer following the installation of CoaguSensTM? Rheolution’s objective is to guaranty its clients get swift return on investment. Our specialists will help you set-up and run the instrument. We will also help you analyse initial data if you wish to share this data with us and it is a common practice for us to establish confidentiality agreements with our customers. A key objective for us is to help you determine optimal cutting firmness to reach the highest possible solids retention rate from your vats. How do I share my data with Rheolution if I wish to? There are two possibilities: either you download your CoaguSens data through Ethernet or built-in USB port and forward data to us by email, or we can log into your CoaguSens system remotely. Are there software updates and improvements to be expected? Yes, there are occasional software updates that aim to improve user experience with CoaguSensTM. These updates may be sent you by email or installed remotely by allowing us to log in to your CoaguSens system. No update is obligatory. What happens if something doesn’t work right or I am stuck with a problem? Just call or email us! We will be happy to answer your questions and fix any issue. You will also find a lot of answers to your queries in our detailed user-guide. What is required to install CoaguSens in manufacturing plants? CoaguSens is bolted to a vibration-free pole or wall and is shipped with a pneumatic anti-vibration system that contributes decreasing environmental vibrations in manufacturing facilities. What connections are required to install CoaguSensTM? 100-240 VAC (50 – 60 Hz) electrical power, Ethernet if you wish to connect CoaguSens to the manufacturing facilities’ network to control CoaguSensTM and export data from a remote computer. Where is CoaguSensTM usually installed? CoaguSensTM is usually installed on the platform close to the upper parts of the vats so that production operators and cheesemakers may quickly start a test and visualise data in real-time. What staff is required to operate CoaguSensTM? Mainly cheesemakers or production operators, but it may also be their supervisors or R&D staff. The touchscreen interface (CoaguTouchTM) is user-friendly and intuitive. What are the weight and dimensions of CoaguSensTM? Dimensions: 31" × 40" × 15" (788 mm × 660 mm × 330 mm) (H × W × D). Weight: 155 lbs (70 kg). What time and resources are required to install CoaguSensTM? Rheolution team installs CoaguSensTM within one day with the support of cheese plant staff who bolt the equipment to a vibration-free support and connect it to power as well as Ethernet network if required. Am I entitled to a training to get up and running with CoaguSensTM? Yes. Typically 1 or 2 training days are organized and given by one of our experts following installation. The duration of the training may vary depending on the size of the production team. Our installation/training expert does not leave the plant until the system and staff are fully operational. A detailed user-guide is also provided. What are the phases of a CoaguSensTM deployment project? There are 3 phases to a CoaguSensTM deployment project: learning/data collection, stabilizing cutting firmness and optimization of cutting firmness to increase solids retention rate in curds. What personnel do I need for CoaguSensTM implementation? Cheesemakers (or production operators) routinely use CoaguSensTM to generate data and process optimization manager (or production manager) use this data to optimize the coagulation step. Is it possible to test CoaguSensTM? On-site demonstration at Rheolution’s select industrial or research partners are possible. Please contact us to investigate this possibility and get more information. What is the lead time to get my CoaguSensTM? Who should I call to initiate a deployment project? What does ''CoaguSens'' stand for? Microvibration pulses are applied to the coagulating milk creating a return signal which depends on the firmness of the sample. This return signal is analysed by an algorithm and converted into an absolute firmness value in pascals (Pa). 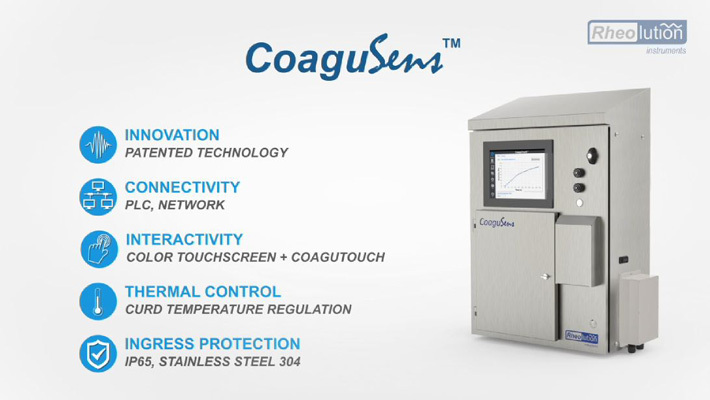 How is CoaguSensTM different from other technologies such as light scattering or hotwire? In contrast to hotwire or light scattering technologies, CoaguSensTM makes direct measurements of absolute firmness in pascal units (Pa). Hotwire and light scattering make indirect measurement of set time (not firmness) that is converted to a theoretical recommended cut time whereas CoaguSensTM displays in real-time the evolution of the coagulum absolute (real) firmness in pascals. What is the added value of CoaguSensTM compared to other technologies? CoaguSensTM is the only industry-proven piece of equipment that measures absolute firmness of coagulating milk in real time. Hotwire and light scattering technologies measure setting time and make an extrapolation of a recommended cutting time that involves multiplication by an empirical factor. Why is it important to measure firmness with an instrument? Pascal unit (Pa) is the true physical unit to measure firmness. CoaguSensTM mimics human finger gel palpation while being 27 times more sensitive and makes quantitative and non-subjective measurements. How does CoaguSensTM exactly mimic coagulation in vats? A 200 mL renneted milk sample is taken from the vat and 2.7 mL is pipetted into a measurement container. This container is placed in CoaguSensTM' thermal chamber which is temperature regulated through the process control automate to mimic the vat’s temperature. Is the milk gel sample altered or destroyed during measurement? No, CoaguSensTM measurements are non-destructive. The microvibrations applied by CoaguSensTM to the coagulating milk sample have only a few micrometers in amplitude and allow multiple non-destructive measurements to plot kinetics over time on a single sample. Is CoaguSensTM capable of automating start of curd cutting? Yes, CoaguSensTM may be connected to industrial automates (PLCs) to trigger curd cutting. At choice, curd cutting may also remain manually controlled. In such a configuration, CoaguSensTM becomes the cheesemaker’s best advisor. What data are produced by CoaguSensTM? CoaguSensTM measures absolute firmness in real-time, displays live coagulation kinetics and monitors cutting firmness as well as cutting time. The parameter-setting interface also allows to save the batch number, the batch date, the vat number, the cheese type and name of cheesemaker. How are coagulation kinetic measurements initiated? The CoaguSensTM operator samples 200 mL of renneted milk and pipets 2.7 mL from that volume into the CoaguSensTM sample container, which is then placed in CoaguSensTM' thermal chamber. Pressing the start button initiates firmness measurements and real-time kinetics plotting. How is it possible to establish the optimal cutting firmness of my cheese? Cutting at different coagulum firmnesses results in different milk solids retention rates. The highest solid retention rate tells the optimal cutting firmness. The solids retention rate is calculated from milk solids and whey solids percentages and measures the efficiency (vat yield) of the critical milk coagulation step in the cheese manufacturing process. What is the solids retention rate (vat yield)? The solids retention rate is the percentage of milk solids (every component but water) that transitions from milk to cheese curd. It represents the vat step efficiency (or vat yield) to convert milk into cheese curds and is calculated from milk solids and whey solids. Why is the solids retention rate (vat yield) better than overall yield to monitor coagulation performance? The solids retention measures the coagulation step performance and the relevance of the chosen firmness at cut, contrary to the overall cheese yield that is affected by cheese moisture and by the process steps that follow the coagulum cut. How is CoaguSensTM data exported and in which format? Data is exported in excel format via a USB key or with an Ethernet connection.